The welfare of the fish should be the first concern when taking images. For Divers: If the ray is partially buried, please leave it alone, it will only swim off if you disturb it. 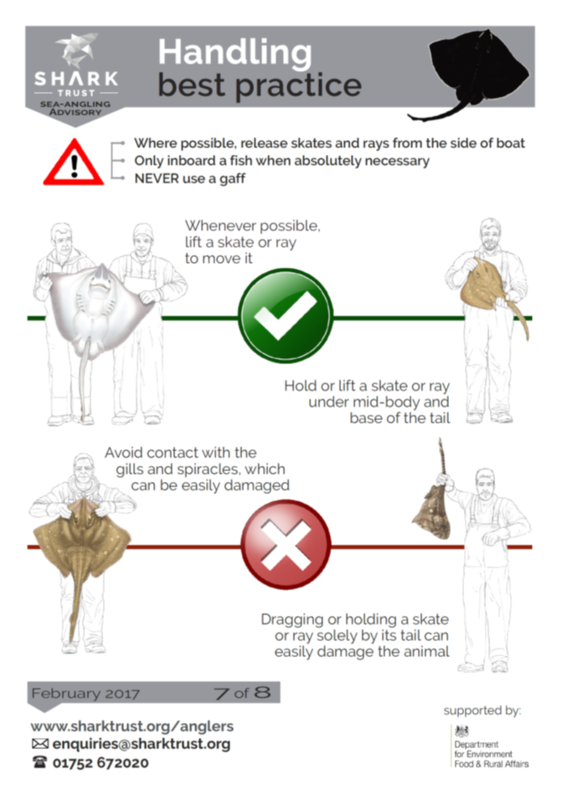 For Anglers: Have the camera ready, follow good handling practice as published by the Shark Trust and MMO and return the fish to the water as quickly as possible. Camera flash reflections - bright reflections or back scatter in under-water images will be interpreted as pattern by the computer system. A dark, natural light photo may be better than using flash. Oblique images or fish not on a flat background - the software is a 2-dimensional analyses, a certain amount of perspective is OK but it downgrades the recognition process. Stones, weed or other foreign objects that obscure the part of the pattern. Poor image resolution normally because the camera is not close enough to the fish. Both images are good for ID purposes, the orientation of the fish is not important; the green murky water does not obscure the pattern. These are not great for ID purposes. Oblique angles and reflections confuse the software and degrade the recognition process. The best images for identification include "the fish, the whole width of the fish and nothing but the fish".